SOLD! Thanks for your interest. Questions will still be answered, and this ad will remain posted for a short time. I am trying to find buyers for a friend’s collection of 18" gauge equipment that is for sale due to the need for downsizing. This line has two operable locomotives, a passenger car which is partially completed (with mechanical and substantial framing finished), plus several service cars. It operated with 2000 ft of track and two switches, with another switch and rail for perhaps an additional 750 feet of track. This sale and equipment move needs to be completed by late October, 2014. 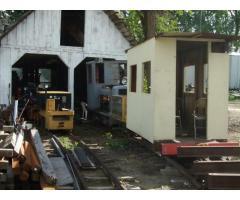 All equipment is easily accessed, and the rail has been disassembled for ease of shipping. Located in Emmett, Idaho. 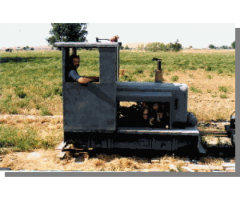 Eighteen-inch gauge railways are about the smallest practical narrow gauge that exists, where an adult can fully stand-up inside the equipment. 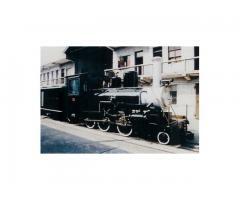 For more on these small railways, consider joining the group "18inch" on Yahoo Groups. 1. 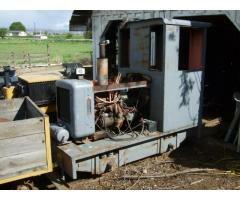 Original, operable, complete Atlas battery-electric "mining trammer" locomotive with relatively new, good batteries. Restored in the early 2000s. Includes a 220-volt original motor-generator charging station (the trammer operates on a 40-volt DC system). Easy to use, and ready to go. 2. Home-bult "Plymouth" style diesel-hydraulic 4-wheel switching locomotive with a 2-53 Detroit engine. Built in the 1990s. 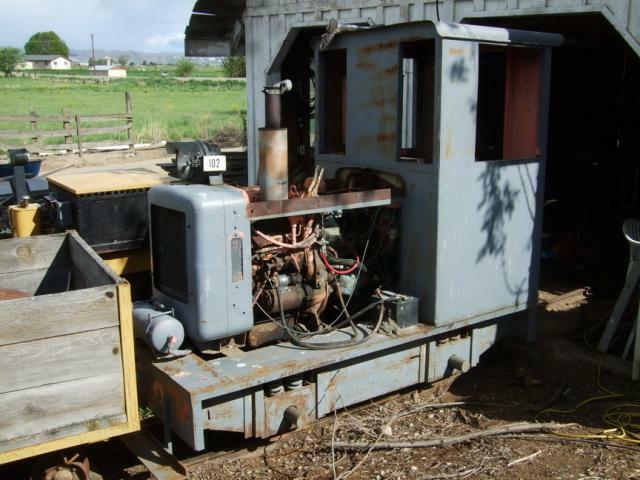 This is an engine converted from a standard gauge tie-inserter, built with a sturdy plate frame, sprung axles, and stand-inside operating cab. Operates well, however maintenance is needed to one of the wheels for use in service. This is a heavy, powerful locomotive. 3. Four-wheel passenger car. This home-built car is of fully welded construction, and is very sturdy. It features end platforms and a high vertical clearance for adults. It would probably allow for about ten adult passengers. Interior furnishings on this car are not completed, but it is otherwise ready to use. 4. Former side-dump ore cars. There are three of these commercially-built cars, which have been made basically into short flatcars by scrapping the hoppers. The wheels and frames to these are in good, functional condition. 5. Disconnect (lumber) cars. 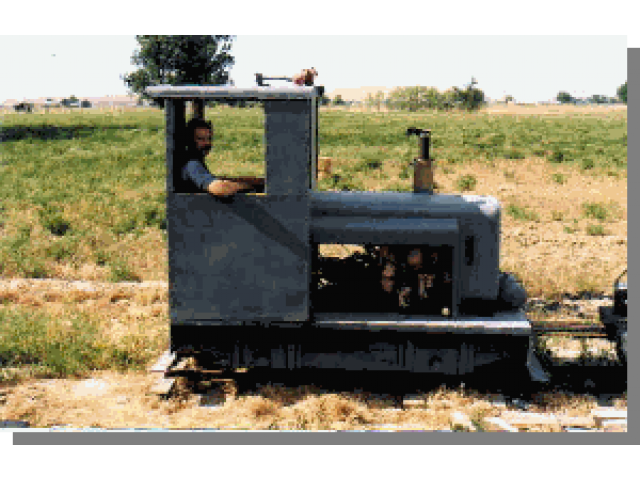 There are two of these commercially-built cars, and were often used in pairs to move larger timbers within mines and around small industrial railroads. 6. One home-built flat car. 7. Track switches for 20 or 30 lb rail. 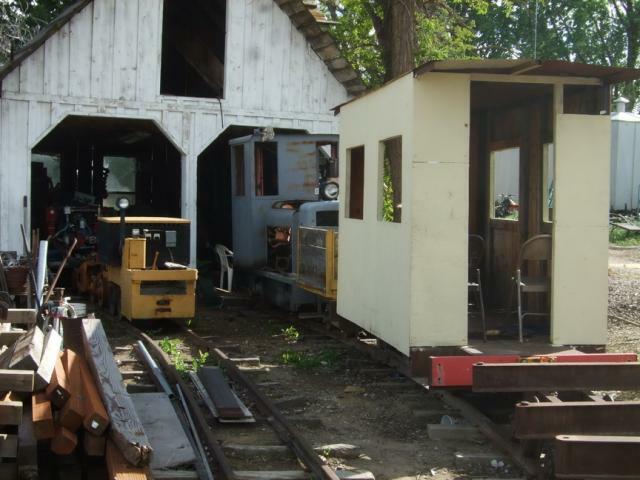 There are three of these including guard rails, connecting rods, and switch stands. 8. Rail. Mostly 20-lb and 35-lb (per yard) although there is some 8-lb and 12-lb in the collection. 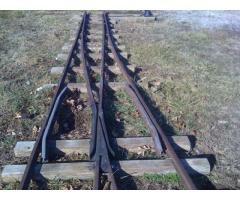 Approximately 5500 feet of rail or good for about 2750 of track. OTM would be included. 9. 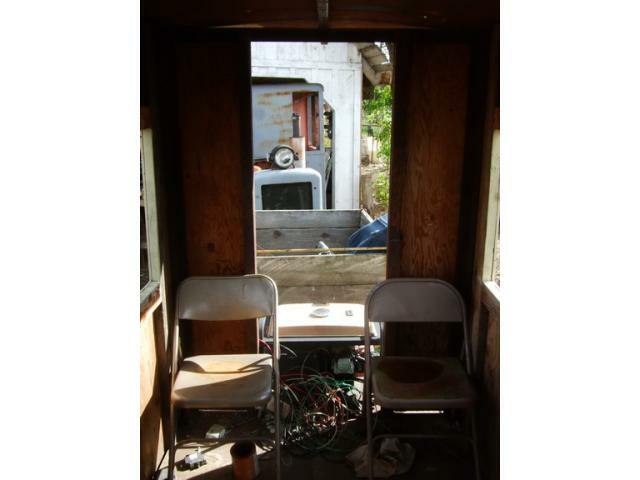 Miscellaneous Parts – additional wheels and items collected for making more equipment. It is desired to sell the entire collection to one person, however sale of individual items will definitely be considered. What interests you? Price: $4500 Or Best Offer, cash or certified check, as is, where is, no warranty offered or implied. Buyer assumes all responsibility for the equipment, and is responsible for removing the equipment promptly. The property it is on needs to be vacated of the equipment. 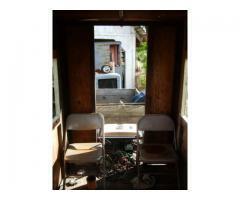 All responses will be kept confidential and will be immediately forwarded to the seller. I will try to answer questions promptly. Other photos available. Thanks for your interest!